By coincidence the house of Armine David and Joan (Bomford) in Weobley (35.9) near Hereford lies close to the ruins of one of the de Lacy castles, and a visit there led to a study of that family and the other Normans who were concerned with Meath and in particular with Trim, one of the most historic towns in Ireland. Although this has nothing to do with the Bomfords directly, it does give background to the town and country they knew so well. Walter de Lacy was a Norman knight who arrived in England with William the Conqueror and was granted land in Herefordshire. He built a castle at Weobley and died in 1085; his eldest son Roger fell foul of William II (Rufus, 1087 - 1100) and was banished in 1096, so Weobley Castle came into the hands of Walter’s second son Hugh; Hugh died in 1115 and the castle was passed to his sister Rohesia (Emma). Emma’s son Gilbert took the name de Lacy and inherited; he rebelled against King Stephen in 1138 but made his peace and went on a crusade as a Knight Templar, and on Stephen’s death in 1157 recovered his possessions including Weobley Castle. In 1170 Gilbert’s son, Hugh de Lacy, went to Ireland with Strongbow, Richard de Clare the 2nd Earl of Pembroke; Strongbow became King of Leinster for which he paid homage to King Henry II, and granted Hugh de Lacy the old Irish Kingdom of Meath (3.2.3) stretching from the Shannon to the sea and consisting of the present counties of Meath, Westmeath, Cavan and Longford. This was the start of England’s connection with Ireland, a largely unhappy union. Hugh, the 1st Lord of Meath, split Meath into Baronies and divided the Kingdom amongst his lesser knights. Thus began the famous names of Tyrrell of Fertullagh and Castleknock, Fleming of Slane, Petit of Mullingar, Nangle of Navan, Nugent of Delvin, Hugh’s cousin Robert de Lacy of Rathwire and Farbill, Dalton, Berford and other Norman Barons said to number fifty. One of the earlier Tyrrells, Walter, killed William II with an arrow in the New Forest in 1100. 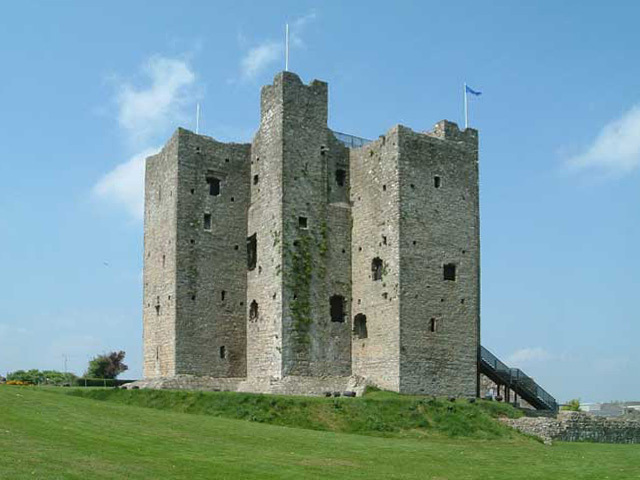 Hugh de Lacy had to capture and control this vast grant so in 1173 built a rough and ready wooden castle at Trim, which he left in the hands of Hugh Tyrrell. However when Hugh Tyrrell was faced by Roderick O’Connor, King of Connaught, and his vast army he burnt and abandoned Trim. Peace of a sort was made when Hugh de Lacy married Roderick O’Connor’s daughter, (she was his second wife), but Hugh was murdered in 1186 whilst inspecting his new castle at Durrow near Tullamore. Hugh had three sons, Walter and Hugh by his Norman wife, and William by his Irish wife Rosa O’Connor. William died in 1233 but the other two were made Earls. Hugh became the 1st Earl of Ulster, granted by King John in 1205, and later became Chief Constable of Ireland; he died in 1242 aged about 66 having had a daughter Maude (below). Walter, the eldest son born c1173, continued his father’s work and built a number of castles, the main one being at Trim which he completed by 1220, and another at Kells. Nothing remains of the Kells castle, but the Trim one was the largest Anglo-Norman fortress in Ireland of which much can still be seen. There was a personal hiccough in the life of these two brothers as King John repented of making the de Lacy family too strong. In a personal campaign in Ireland in 1210 he expelled them both; after his defeat over Magna Carta in 1215 King John had to restore them both; Walter was restored at once to Meath, though Hugh was only restored to his land in 1227 but not to his title of Earl of Ulster. Later they worked together and attempted the conquest of their land in the Erne and upper Shannon area. Walter died in 1241 leaving two daughters, and two years later Hugh died without heirs at all. So ended the de Lacy line and the area lost its unity. As the English hold on Ireland deteriorated in the next two centuries only part of Meath remained inside the Pale under the direct rule of Dublin with Trim Castle a strong point on the Pale border. However both these daughters married; Margery, the second daughter, married John de Verdon who inherited the Westmeath portion of the lordship of Meath, Weobley and the other English estates, and died in 1309. Margery’s second son, Theobald de Verdon, married Maude the daughter of Edmund Mortimer, Lord of Wigmore, and when she died Theobald married secondly. Elizabeth the widow of John de Burgh and daughter of the Earl of Gloucester. Theobald de Verdon became Justice and Lieutenant of Ireland in 1313. Margery’s eldest son John died in 1296 and the youngest son became ‘Lord of Weobley’. Walter’s other daughter Maude or Matilda (died 1302) married Geoffrey de Geneville, or Joinville, in 1250 and inherited the Liberty of Trim. Geoffrey, technically Geoffroi, Sire de Vancouleurs, had been brought up in France but came to the English court of Henry III where he met and wooed Lady Maude de Lacy; she was a fine prize as she was co-heiress, with her sister Margery de Verdon of the vast de Lacy estates in England and Meath. They decided to make Trim their home and set about modernising and extending the great stone castle which served them as a domestic home, as it did to later Lord Lieutenants until about 1350 when, with no family in continuous residence, it began to fall into a state of disrepair. In 1263 Geoffrey and Maude introduced the Dominican Order to Trim and established the Black Friary for the ‘Black Friars’, as the Dominicans were called from the colour of their cowl, just outside the town walls between the Athboy and Navan Gates; this became their family church. After spending, several years fighting in the Ninth Crusade, 1268 - 1272, with Edward, Prince of Wales, Geoffrey returned to Ireland; and, no doubt because he had become the confidential friend of Edward who had by now become King Edward I, he was made Lord Justice of Ireland in 1273. He continued to hold the Lordship of Meath until 1308 when he resigned and spent his remaining six years as a simple monk in the monastery he had founded. His estates passed to his daughter Joan de Geneville (died 1358) who had married Roger Mortimer (died 1330) the Earl of March. The Mortimer family came from Mortemer-sur-Eaulne in Normandy and had followed William I to England where they were granted much of the estate of Roger of Hereford and had settled at Wigmore. The marriage of Roger and Joan de Geneville forced Roger to leave Wigmore in order to control his Irish estates against his wife’s family, the de Lacys. He was soon to find how the return of an absentee of English birth could arouse the hostility of both Irish and Norman. The junior Lacys and Verdons were rooted in the Irish soil and had taken many Irish customs; they were often called ‘degenerate English’ by the likes of Roger Mortimer because for one reason they resented the feudal Norman law by which lands and titles passed through the female line, and like the Irish they believed in male succession. When therefore Meath was re-divided in 1308 the junior de Lacys of Rathwire resisted, and even the younger de Verdons had no love for the chief of their name. Their opportunity occurred in 1315 when Edward Bruce, the brother of King Robert I of Scotland, invaded Ireland and, in the first serious battle the Scots with their 6,000 veterans of Bannockburn clad in mail and a similar number of Irish armed with light axes, swords and spears, defeated the Red Earl of Ulster, Richard de Burgh (see below). Edward Bruce then invaded Meath, was joined by the young de Lacys and de Verdons, and crumpled up the large but untrained levies in a series of battles culminating at Kells where Roger Mortimer was defeated and the town sacked and burnt. England was slow to react but eventually King Edward II appointed Mortimer his Lieutenant in Ireland, and in 1318 Edward Bruce was slain in battle near Dundalk. There was little thought of vengeance and the de Lacys and de Verdons, were restored to most of their estates. Roger Mortimer then concentrated on amassing estates in England and gained a position where, with the assistance of his lover, King Edward’s Queen Isabella, the King was imprisoned and killed. During Edward Ill’s minority Isabella and Mortimer ruled England. In 1330 apprehensive barons made the young King Edward assume power; Mortimer was hung at Tyburn and Isabella withdrew to luxurious life imprisonment. His grandson, another Roger Mortimer (died 1360) became the 2nd Earl of March, a title derived from the Marches or border region between England and Wales; he became friends with the young King and had most of his estates restored. The 3rd Earl of March, Edmund Mortimer (died 1381 at Cork) married in 1368 Lady Philippa Plantagenet (1355 - 1381), daughter of Elizabeth de Burgh and Lionel of Antwerp, Duke of Clarence and son of King Edward III. This marriage brought Edmund Mortimer both Ulster and Connaught, and the Clare estates, all inherited from Elizabeth de Burgh (below), so with Meath and his marriage into Royalty he became politically very strong. His son Roger, the 4th Earl of March, was Lord Lieutenant of Ireland from 1374 until he was killed in a rash attack on the Wicklow clansmen at Kells in Co Kilkenny in 1398. Edmund was the 5th and last Earl of March. His descent from Lionel, Duke of Clarence, gave him a better claim to the English throne than that of King Henry IV whose father, John of Gaunt, was a younger brother to Lionel. Edmund was therefore kept under close supervision by Henry IV; however he became friendly with the Prince of Wales, Henry of Lancaster, known as Prince Hal, who, when he came to the throne as King Henry V, restored to him his full freedom; Edmund had revealed to King Henry IV that there was a conspiracy to put him on the throne instead of Prince Hal, and that the conspiracy was led by his own brother-in-law, Richard Earl of Cambridge, who consequently was beheaded in 1415. In 1423 he was made Lord Lieutenant of Ireland and in 1425 he died of plague at Trim Castle. Since Edmund was childless all his titles and land passed to his nephew Richard (1411- 1460), son of his sister Anne Mortimer and the Earl of Cambridge. Richard became Duke of York in 1426 and the old English of Ireland and the Gaels transferred their affections to him on the death of his uncle Edmund Mortimer, and remained almost to a man for the White Rose during the Wars of the Roses. Like Edmund, Richard Duke of York was also a contender for the crown so, to get him out of the way, he was sent to Ireland as Lord Lieutenant. He lived for the ten years 1449 - 1459 in Trim and built the square tower of St Patrick’s Cathedral which incorporates a plaque showing his arms; he may also have built the Yellow Steeple. Richard returned to England to claim the crown but was killed at the Battle of Wakefield on New Year’s eve 1460, but his son was crowned King Edward IV in 1461. The Earldom of Ulster has since been held by members of the Royal Family. It was Edward IV’s two little Princes who were murdered in the Tower of London aged 12 and 10 by their uncle Richard III. This ruthless usurpation of the throne set up such a public outcry that discontented Englishmen started gathering and finally Richard III, was killed two years later at the Battle of Bosworth Field. That was the end of the Wars of the Roses and the start of the House of Tudor. The other major family who were tied by marriage to the de Lacys was that of de Burgh, Burlce or Bourke, or de Burgo, later to become the Earls and Marquises of Clanricarde of Portumna Castle in Co Galway, a large semi-fortified Jacobean house built in 1618 by the fourth Earl. The family was founded by William de Burgh (died 1206), who went to Ireland with Prince John in 1185 and was consequently granted large tracts of Connaught by King Richard I. He spent much of his time trying to establish his rule there but was not successful. His son Richard (died 1243) was much more successful and was known as “The Great Lord of Connaught”; he made Galway his chief stronghold and built the castle there in 1232. Richard married firstly Una, daughter of Hugh O’Connor King of Connaught, and secondly Egidia, daughter of Walter de Lacy; he had three sons, Richard, Walter and William. William was the ancestor of the now extinct Marquises and Earls of Clanricarde. The eldest son Richard inherited but died five years after his father in 1248. His brother Walter (c1230 - 1271) took over and continued to fight the Connaught chieftains, and was able to add greatly to his already vast domains; he married Maude, daughter and heir of Hugh de Lacy the younger, Earl of Ulster, and so became the first (de Burgh) Earl of Ulster as well as being Lord of Connaught. Walter was succeeded by his son Richard de Burgh (c1259-1326), the 2nd Earl of Ulster known as “The Red Earl”. He spent most of his 40 years of activity in Ireland, where he was the greatest noble of his day, usually fighting the native Gaels or his Anglo-Norman rivals, the Geraldine’s. He also took his forces to Scotland in aid of Edward I, which ended in Edward’s defeat at the Battle of Bannockburn and the start of Robert Bruce’s reign in Scotland; he was also defeated by Robert’s brother, Edward Bruce, during his invasion of Ulster in 1315. The 3rd Earl, William de Burgh (1312 - 1333) was the son of John de Burgh and his wife Elizabeth, The Lady of Clare (died 1360). Elizabeth was co-heir and sister of Gilbert de Clare, Earl of Gloucester and Hertford, who, was killed at Bannockburn in 1314. When William de Burgh was murdered in 1333 by his own tenants near Belfast, he left a daughter, the sole heiress not only of the de Burgh possessions but also of vast de Clare estates, which extended into twenty English counties. This daughter, Elizabeth (1332 - 1363), was married in 1342 at the age of 10, to Lionel Plantagenet, aged 4, the 3rd son of King Edward III. Lionel (1338 - 1368) was made Duke of Clarence (a later form of de Clare) in 1362, after the death of his wife’s grandmother when he inherited the de Clare estates. Their only child Philippa Plantagenet married Edmund Mortimer, 3rd Earl of March (see above). Trim and its castle were concerned with all the uprisings of medieval Ireland and from the coming of the Normans to around 1350 it was an important centre of power which was then lost to Dublin. There were no castles in Ireland before the Norman invasion. The Norman French was an aggressive race that had already developed a superior art of war and fortification as displayed in England, south Italy and Palestine. Their mounted soldier of gentle blood wore a mail shirt covering his body, thighs and arms, and a conical iron helmet with a guard for the nose. Their horses were light coursers, which had no armoured protection. This equipment proved the right thing for fighting the Gael in rough and wooded terrain and lingered on for some generations, even though elaborate plate armour for man and horse was to become fashionable by 1200. Many of the ordinary Norman soldiers were archers and the arrow was virtually a new device to the Irish, which gave the Normans a distinct advantage. On the other hand the Irish Gael, though given to war and with plenty of natural courage, for the most part fought in linen tunics with light axes, swords and spears. There was a further basic difference, one of attitude; to the Irish kings a battle was intended to achieve an immediate object, and that achieved their amateur armies retired. To the Normans war was a business from which profits were expected; once they won a battle, the next step was to build a castle, impregnable to the Irish, and then to organize the conquered country into baronies and, if necessary, seek a charter for it from Earl or King. This is what they did in Ireland. Strongbow invaded, won and placed his barons throughout the conquered land, - Fitzgerald of Naas, Bermingham of Carbury in Co Kildare, Carew of Carlow, de Lacy of Meath, and so on; thus were founded in Leinster many names famous in later history. As we have seen de Lacy then placed his knights and barons through out East and West Meath and they built their own castles. So Meath, and indeed all Ireland, was scattered with hundreds of castles ranging from the minor castle of the Betagh family on Oakley Park to the biggest of all at Trim. Although it was not his original intention Strongbow submitted to the King of England, Henry II, an aristocratic leader who normally chose his subordinates well. We have seen at various stages how the English Kings were worried that their Norman Barons had gained too much strength; Henry II sent his son John, later to become king, to Ireland largely because Hugh de Lacy had taken an Irish wife and had aroused Henry’s suspicions that he meant to make himself King of Ireland; Ulster was another area of worry, de Courcy who had never submitted to King Henry was ousted by the younger Hugh de Lacy who was in turn ousted by de Burgh. Thus the balance of power swung from one family to another. The persistent flaw in English rule in Ireland was the absence of the monarch himself, and so at anyone time there was a handful of men who controlled the greater part of Ireland and whose feudal interests formed a hedge, which the Crown was not likely to break through. Another barrier to the control of Ireland was that those Normans who first invaded the country were a family party from South Wales. Their overlord was the Earl of Pembroke, and the King of England was their even more remote overlord, but loyalty to both sat lightly upon them. Almost every one of them had Welsh Celtic blood and so were well qualified to master and to understand the Irish Celts. It was no great step for them to delight in the music, language, and ancient epics of Ireland. Nationalism was scarcely known to these men, who had come over as Frenchmen and had not the time to become English. They were proud of their blood, speech and traditions, but they were adaptable and could treat as equals any race that they could respect. Their inclination was towards the Irish Celts rather than the Anglo-Saxons; they spoke French but already knew something of the Celtic speech from their time in Wales, and probably their knowledge of the English language was even less. Indeed even in England French was the official language of the country, and it was not until the mid-1300s that English was made the official language. These Normans were only too ready to make happy marriages with Irish princesses, and in time they were to become more Irish than the Irish becoming, as they were later termed by the English, “degenerate Irish”. When the Normans arrived in Trim they would have found that the town contained a couple of churches; St Patrick’s, supposedly on the site of the first church built in the area by Saint Patrick in 432, and, a few hundred yards away, St Mary’s Abbey, later called Talbot’s Castle, which was then a monastery with a bell tower. St Mary’s was burnt in 1368 and the present Trim landmark of the Yellow Steeple was built after the fire. By the mid-1600s the Abbey had decayed but the Steeple was maintained as a watchtower until it was partly destroyed at the time of Cromwell. Just before the Normans arrived, the Synod of Kells of 1152 amalgamated the small monastic diocese of Trim, Ardbraccan, Slane, Duleek, and Clonard to form the Diocese of Meath; Kells was later united into the diocese. The bishop of this larger diocese lived at Clonard, which already had a splendid monastic history of the early Irish Church. When the Normans gained power they placed their own people into positions of power in the church. In 1194 Simon de Rochfort became the first Anglo-Norman Bishop of Meath, but Clonard, being on the edge of the Pale about 12 miles south-west of Trim, was not the safest place for an Anglo-Norman bishop to live and, indeed, Clonard was attacked and burned soon after Simon de Rochfort was installed. In 1206 Simon moved to a-site beside the Boyne about half a mile to the east of Trim where in 1202 he had started to build the Priory of Saints Peter and Paul, and the largest Cathedral in Ireland in Gothic style. Although de Rochfort enjoyed the confidence and support of the powerful de Lacys, he sited his buildings far enough away from Trim to avoid paying taxes and tolls to the Lords of Trim. The Priory was completed in 1206 and given into the care of the Victorine friars, an Augustinian Canon Regular. Simon de Rochfort died in 1224 and was buried in front of the high altar in his cathedral. The church continued to serve as Cathedral until the suppression of the monasteries at the Reformation. There was no cathedral in Meath from that date until 1955 when St Patrick’s, Trim, was elevated to cathedral status.